Elisabeth Easther flies aboard Air Chathams flight 3C591 from Auckland to Rēkohu, Chatham Island. The Plane: A Convair 580, the fastest multi-engine turbo-prop aircraft operating in Aotearoa. Class: Egalitarian, just the one. Seat number: First in, best seated, and for the record 3C and 3D on the way over and the two rear aisle seats for the return. 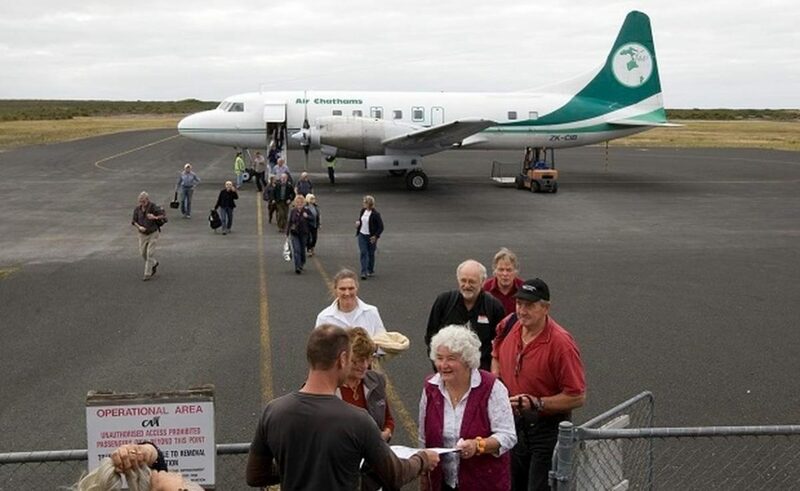 Airline history: Operating since 1984, Air Chathams is now New Zealand’s largest privately owned airline with six routes and 80 flights per week. Prior to the birth of Air Chathams, the lucrative live lobster industry was virtually non-existent. Cray-zy. On time: On the dot and, once onboard we were advised to put our watches forward 45 minutes on the way there, and back heading home. The Chathams might feel like a trip back in time, but these islands are actually marginally ahead of the rest of the world. Fellow passengers: A dreadlocked diver; a woman who grew up on further-flung Pitt Island going home for the holidays; local kids coming home from a Gold Coast holiday, one of whom was carrying a toy truck as big as my actual car for hand luggage. A group of well-heeled mature travellers and two hearty looking young hikers in Gore-Tex and Lycra. Entertainment: Gazing out of the window and imagining the adventures ahead. Food and drink: In-flight service consisted of water, tea and coffee and, on the way there, a Tim Tam and, on the way home, an actual sandwich. Lollies on landing. Word of warning: Do not miss your flight, as there are just two in and out of Auckland during summer, and one flight a week in winter — although you can also fly from Christchurch or Wellington. One off: On the return flight, my seatmate was an utterly delightful crayfisherman called Digby. At arrivals, I offered to give him a lift to his craypot workshop, and he gave me a crayfish. I’m confident that is the first and last time that will ever happen to me. Verdict: We are bound to fly with Air Chathams again because my son and I declared our trip to Rēkohu one of the best holidays of all time.